The soft crunch of breakable crust on a crisp bluebird day. My tracks traverse the slope back for 100 feet of steep snow to a belay. A molded snow fin blocks easy passage into a couloir. A tinny mental alarm buzzes in my brain as I whack and stomp my way through the heavy congealed mass sitting at a 50 degree tilt. The flute protrudes from the slope like a fat tapered surfboard. I feel the tension in the flute as I bust through and finally straddle the thing. I’m almost across, and I know the clock is ticking. I quickly plunge both my ice tools into the firm, creamy snow of the leeward slope. Then, just like that, a crack splits the snow right below my tools. The fracture is perfectly horizontal. It shoots out in both directions. Tons of snow start sucking me down. As usual in these situations, time slows down and a million calculations race through my brain… a one-hundred foot runout… no intermediate gear… a 40-foot cliff lurking below. The rumble of debris builds below as the slide rips down the couloir. Once more, I’ve crossed that line where climbing becomes more than a game. This is gonna hurt. Climbing’s beautiful modes of expression, levels of physical challenge and requisite mental gyrations are enough to calm the most obsessive. My climbing career, though organic, bears all the hallmarks of mania. I started out as a boulderer, moving through the various disciplines—top-roping, cragging, multi-pitch climbs. I got to play a tiny part in the advent of bolted rock in what later became known as sport climbing. The path widened—big walls, hard aid, ice, mixed climbing—the path ever driving me to the big mountains. At first, the organizing principle for me was technical difficulty, but over time I felt like too much of a technician. Beauty, aestheitcs interested me more. The aspect of risk, a thing most people work to avoid, jumped from incidental to compulsory. But the bigger the undertaking, the greater the commitment, the objective hazards and the corresponding risk. The mountains hold no monopoly—a high ball or a mandatory 40-foot runout on desperate climb each present their own unique and deadly hazards. The first time I nearly died was on El Cap. My partner, a veteran of countless epics, and I got stranded in a storm at the worst possible place imaginable. We had just two ropes—insufficient to escape the huge overhang below our bivy ledge. I sat for two days huddled, soaked in snow and freezing water. My bivy sack reeked of ammonia—I didn’t want to piss myself, and I later found out that that this was the smell of muscle breakdown in lieu of other fuel. A day into the ordeal, I asked my partner, Are we going to be okay? His reply, How the hell should I know. 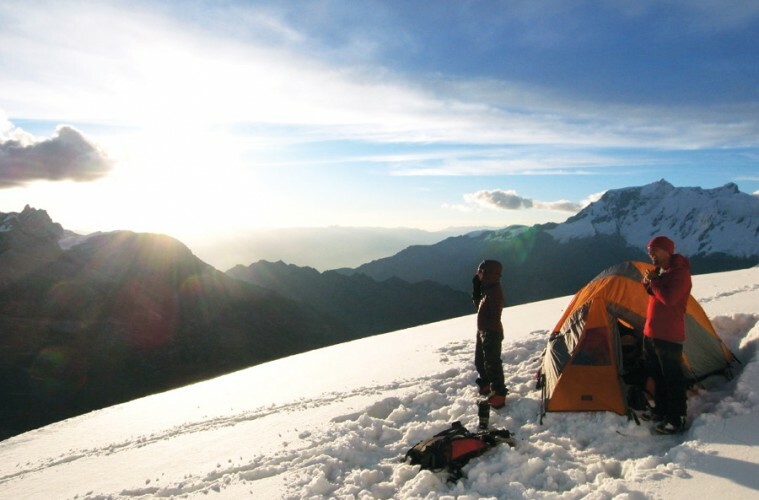 Hemingway once famously stated that mountaineering was a sport and not a game. I consoled myself with that bit of wisdom and some intense prayers to an as-then-undefined deity. Most climbers would prudently quit or at least learn enough to never get in the same predicament. Not me. And similar things kept happening. Epics—fated, pre-ordained, subconscious fulfillment… I figured that each instance was a rarefied set of events, that they would be transformative after the scare. Perhaps, the point. If you survive, the experience dwarfs the memory of the mere act of climbing. The next episode happened so fast that there was little time for contemplation. I was struck by falling rock one morning on a new route on Half Dome. That accident predated the convention of wearing helmets. I only had time to watch as a tourist-trundled boulder mercifully exploded on the wall 20 feet above, while I huddled in aiders, head wrapped in my arms. A chunk of shrapnel cut my face and arm. I bear the scars to this day. he difference between an epic and a near-death experience is that near-death requires the hand of fate or chance to save you. Epics tend to be inconveniences played out over time—more a test of will and patience than fate. Years later, I was treated to a combination of both. I was stuck on a mountainside for hours bracketed by wet snowslides as a storm raged and my partner fought through a sparsely protected mixed pitch. He’d chosen to carry on despite my urging that we take shelter on a ledge below. I was afraid the belay would rip in a fall or that we’d be swept away at the whim of an avalanche. Better him than me was my thought. It’s hard to admit, but that’s the truth of it. Looking back, I can see a progression, a sequential unfolding of events and an indisputable revelation. To the outsider it all looks foolhardy, a death wish, an addiction. Those definitions are merely attempts to describe something unfathomable and frightening—the conscious acceptance of mortality. To accept is not to acquiesce. And it can promote compassion. A few years back, three climbers and I took shelter in a crevasse during a massive storm in the Himalayas. Our first night, we were struck by an avalanche. In the instant following the slide, I pulled my partner from the flood of debris. Blind luck allowed me to grab his hand before he was sucked under. He’d gotten snow in his trachea. Even bigger slides followed. One effectively sealed us—tomb-like—in the crevasse. I had to dig a 25-foot tunnel, only to emerge greeted by the sound of continual snow slides. This went on for three days, long enough to ponder mortality and be given up for dead by our basecamp team. The notion of heroism is another casualty of the near-death experience. Such monikers belong in press clippings and adolescent fantasy. They are eventually replaced by an objective acceptance of what might be. Alpine climbing is defined by its aesthetic and a good part of that is risk. To choose to continue is to choose mortal risk. One who does not acknowledge this brings a fool’s paradise to the mountains. The real tragedy in this business is the loss of those who didn’t accept what they were getting into. ack to my slide at the beginning of this story. My life doesn’t flash before my eyes. My heart rate barely lifts above the baseline exertion. There’s a clinical detachment, any fear lost in the savage joy of the moment. I’m not afraid of what’s going to happen. I’ve been here enough to accept that this is what I signed up for. My feet are swept out from under me. My ice tools shift under my body weight. At the same time, the ropes come tight, cutting into the exposed snow below the crown. I lean into the slope as the slab slides by. I don’t even make a sound. The slide picks up speed, but, as the couloir opens up, it slows and hisses to a stop. I call for slack and finish the pitch. Looking down now, the slide is small enough to discount as a true near-death incident. The event feels almost incidental—as if nothing important happened. I carry on—three of my nine lives intact and ready for what comes next. —Pete Takeda is a Boulder-based climber and screenwriter.